It is projected that by 2088, the world will run out of fossil fuels. We could even deplete our oil by 2040, or our natural gas by 2060. This may seem inconceivable, but taking into account the rate that we are guzzling energy, and the fact that this rate is constantly increasing may means that our lights will go out too soon. But do not fear! Renewable energy is forthcoming. There will never be a day when the sun is not shining, or the wind is not blowing, or at least, not in the near, foreseeable future. Renewable energy has minute if any emissions that contribute to global warming, improves public health and the environment, and is inexhaustible. Yet today, the world still uses 81% fossil fuels, with 34% oil, 21% natural gas, and 26% coal/peat. All the renewable energy used in the entire world is less than even one of these resources, at only 13% usage. The advantages of using renewable resources are many, and for a better future, a change needs to be made. So why is it that we still use so much nonrenewable energy? 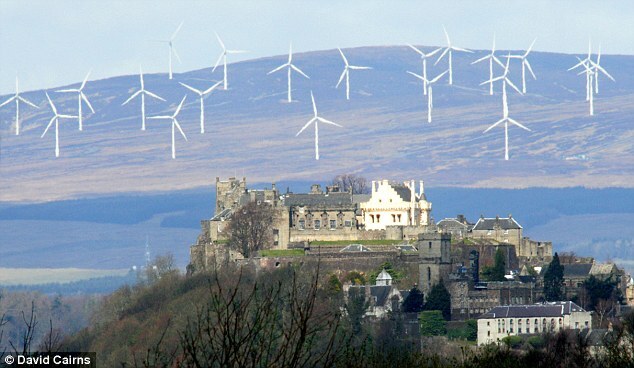 This problem with wind turbines is even plaguing Scotland, with the Daily Mail reporting that “They are famous Scottish landmarks which have withstood wars, weather and centuries of change – but they could not escape the Scottish Government’s green agenda.” And I agree: these turbines placed around beautiful mountain ranges, historic sites, and rolling hills are certainly an ugly blot on the landscape. This leads people to despise the idea of renewable energy. Eventually, the turbines will be disposed of due to unhappiness of the people. This only digs the world deeper into the hole it’s already dug much into: we need renewable energy to be used more, yet it’s becoming disliked, so it’s not. But a new option is emerging, something that blows all other ideas for clean energy implementation out of the water. What if, instead of attacking the world’s energy problem with boring, ugly white turbines, or a black, brooding expanse of solar panels, people were to approach this problem from a different angle? Instead of only productivity, why not combine productivity and beauty to create an efficient masterpiece? Yes, there is a solution! Innovative companies are turning ugly wind turbines into something beautiful. They are, in essence, taking the meaning of the word “green” literally. The first of these companies is NewWind, based in France. 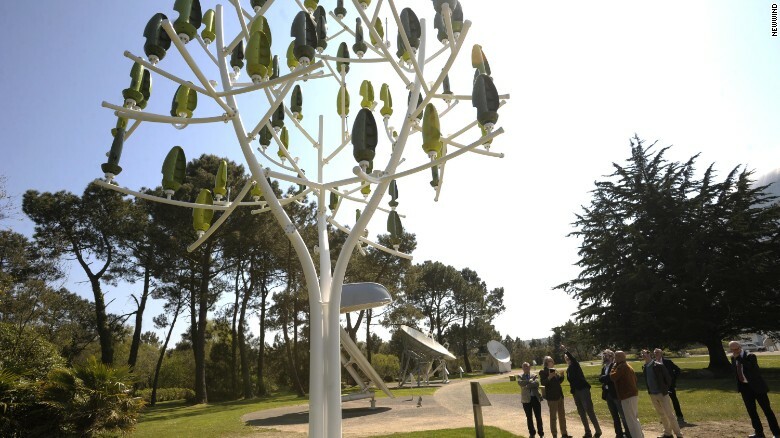 NewWind has created an artificial Wind Tree, which uses tiny leaf-shaped turbines to harness the power of the wind. They can utilize anything from the smallest breeze to a giant gust of wind. They are completely silent, as well as modern, sleek, and pleasant to view. They produce 3.1 kwh of energy. Though they are not quite as efficient as your typical turbines, which produce anywhere between 5-10 kwh or more, nonetheless, they have been praised and lauded by countless websites and magazines. They are currently are being used in Brittany, France and are set to be installed at the Place de la Concorde in Paris in March, 2015. In my opinion, they are most certainly energy made beautiful. Another emerging invention is the Power Flower created by NL Architects. The biggest advantage of this power flower is that it minimizes space needed to function. Instead of a huge turbine, it’s a thin, lean build that utilizes vertical turbines for maximum space-saving. Just like the Wind Tree, it is basically silent and can absorb wind that blows form any direction. Though there are many plans for the Power Flowers to become domestic energy solutions, there have not been many installed just yet. But, the plans look incredibly promising. This is yet another example of a minimalistic, clean, attractive build that will certainly be admired by customers. Fig. 7: A plan showing how the Power Flowers could be seamlessly integrated into the landscape. 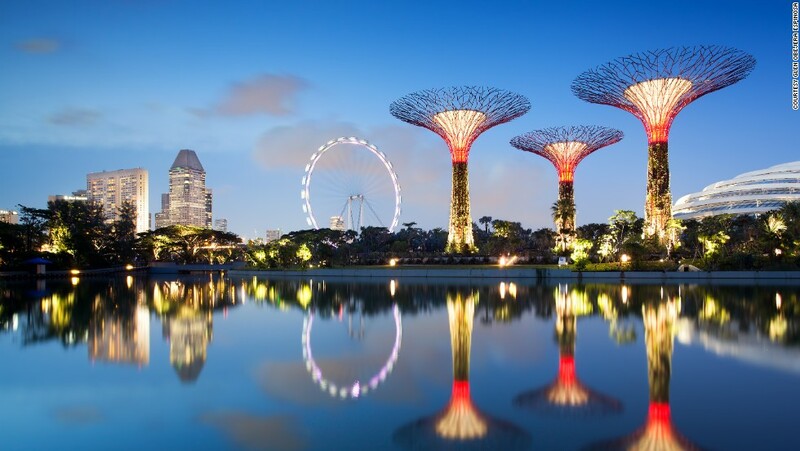 Lastly, the Gardens by the Bay in Singapore is an example of an already functioning innovation that has smoothly merged into Singaporean culture. There are many words to describe the Gardens by the Bay, but the first that come to mind are awe-inspiring, breathtaking, and incredible. They are unbelievable feats of architecture, and look like they have popped out of a futuristic movie. 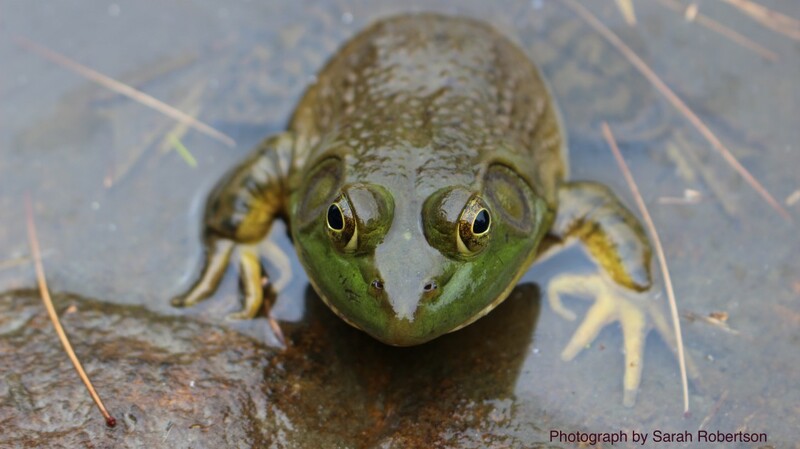 They do not make people turn away, but rather, are an attraction that draw citizens and tourists alike near. But these Gardens are more than beautiful. As well as spectacular, they are also incredibly efficient. The trees are layered in solar panels, act as cooling ducts for nearby conservatories, collect rainwater, and de-humidify air before this cooling. Singapore is filled with high rises, skyscrapers, and a dense city landscape. Their initiative should be one that is followed by cities around the world: to transform their community into a greener place, both physically and energy-wise. The world is transforming into a viridescent place, and a more beautiful one, too. 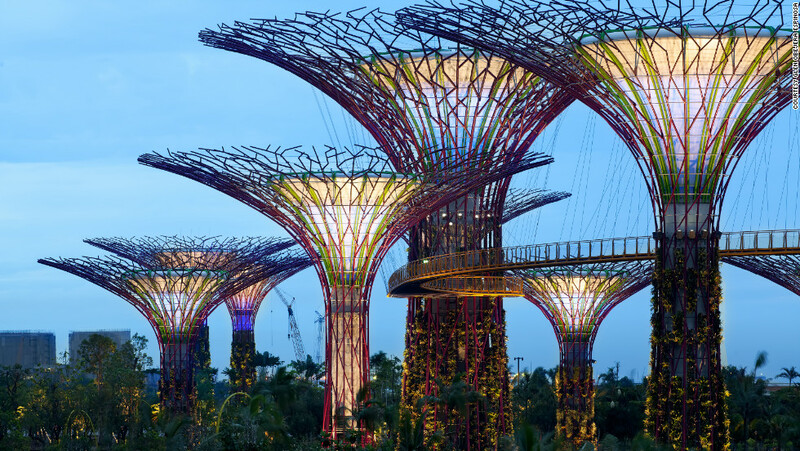 I believe these three projects, the Wind Trees, Power Flowers, and Gardens by the Bay, will motivate people to become more excited about energy efficiency, rather than despising of it. They will look forward to the beautiful installations, and benefit from the clean energy that they produce. It was once believed that the stark white wind turbine, or black expanse of solar panels was the future, but I believe that real future is the combination of beautiful architecture and renewable energy. Hi Sarah! I like the picture in your blog entry of the solar panels in Singapore. This is the kind of development that solar energy in our country needs. Even if the improvement is not about efficiency, but about architectural aesthetics, use of solar panels in this way beautify a city and make more companies, buildings, and countries want to use solar technology. How much more beautiful is the Singapore picture than this dull North Dakota oil field?